Beverages are common drinks during festivals but most of the time people are not interested in collecting the used packaging to get it recycled. Many times even, the festival venue is not as clean as it ought to have been, as recycling is not the first priority for people attending a festival. Recyclage@Festivals encourages music fans to keep the space clean and to return their beverage containers or the ones they find on the ground so that festival organisers can collect them in the best way, in a separate waste stream. Packaging plays an essential role in meeting consumer needs and preventing waste. One of the ways to achieve this is using recycled materials and engaging consumers to join us on the journey. 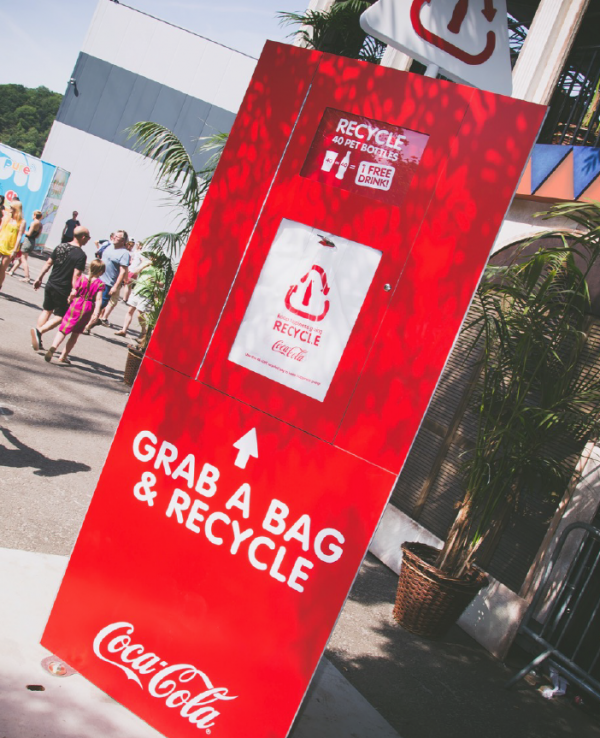 To further improve recycling rates Coca-Cola is focusing on consumers who are on the move. This is why we launch recycling programs for example at festivals. All consumers can do as they choose, but Recyclage@Festivals gives them the chance to contribute to a more circular and sustainable economy. We see used packaging not as waste but as a valuable source for reuse in new packaging. We therefore join forces with packaging suppliers, local governments, customers and consumers in order to collect and recycle as much packaging as possible. It is our 2020 commitment to support the development of the circular economy, to use recycled and renewable materials and recycle more packaging than we use. For this we increase packaging recovery rates by using our brands to educate and inspire consumers to recycle more often. PRINCIPLE: Recycling is introduced in an entertaining environment while people have the choice not to follow it. The project showcases that we can only win from recycling. Recyclage@Festivals aims to make recycling the norm for everyone and fit for any lifestyle. The nudge is to help people recycle rather than discard empty bottles, and this by making the recycling bag salient and useful to carry the empty bottles from the consumption point to the recycling point. Additionally the nudge gives the possibility to receive a drink voucher or to win a ticket for the festival next year. EXECUTION: This video shows the nudge in action! FIELD EVIDENCE: Reyclage@Festivals has distributed 40.000 recycling bags, each recycling at least 25 bottles . 25 bottles per recycling bag is far more than the average number of bottles each festival fan drinks her/himself during a festival, which indicates that each user of the bag recycled more than her/his own consumption, which was the intention of the nudge.